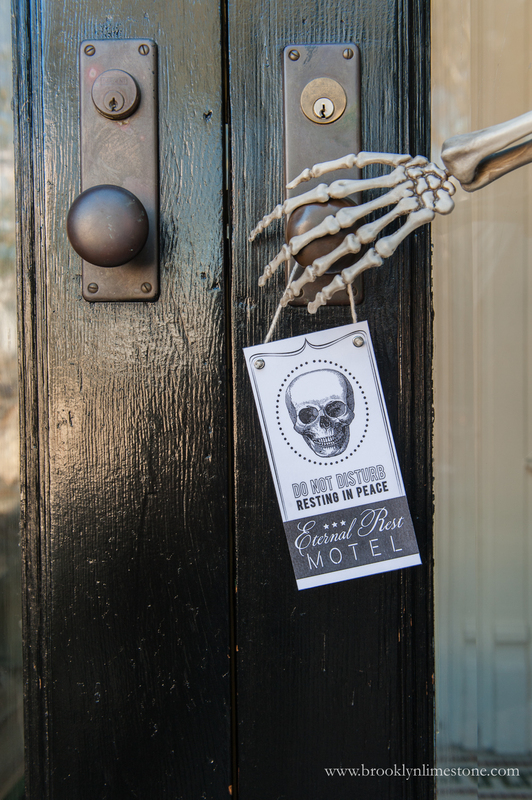 With October underway, it was time to get the Halloween decor out and about. This year we went with a Haunted Hotel Halloween Theme - the Eternal Rest Motel. Something just a bit spooky without being too scary for the kids. As in years past, the decor is a mix of DIY, print design and ready-made items mixed in. Disclosure: This post was sponsored by Lowes but all opinions expressed are my own. 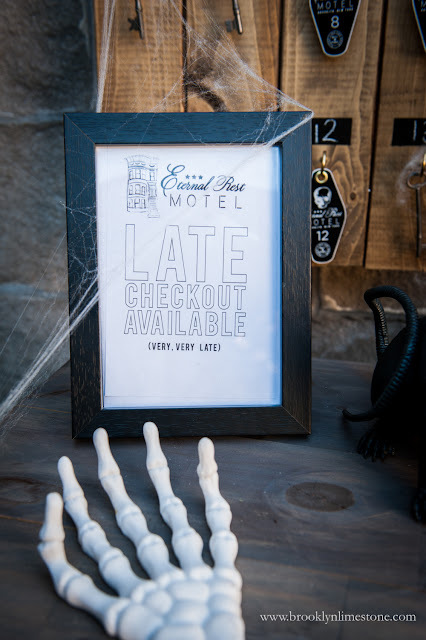 This year I got extra lucky and was able to partner with the fabulous team at Lowes Home Improvement for both the DIY and the ready-made elements to make this Haunted Hotel Halloween a success. 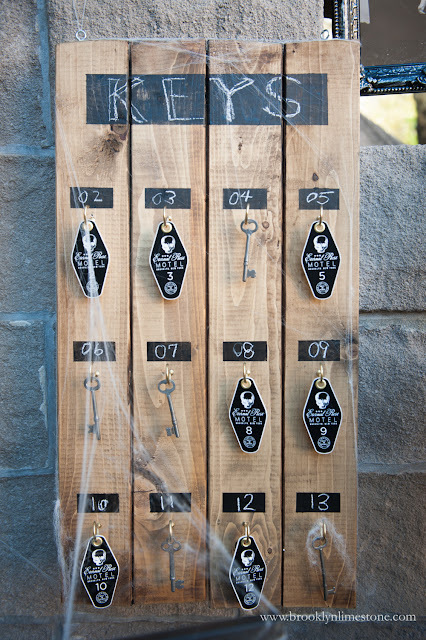 This year's DIY elements included two hand-painted signs, the concierge desk, the door hangers and the key rack. 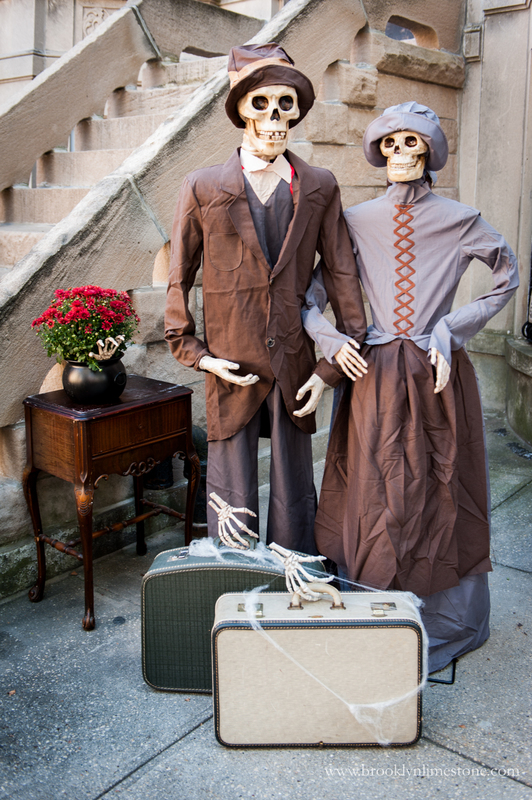 A skeleton check-in attendant and concierge are the perfect compliment to our weary traveling couple that was a new addition this year. Their costumes are super fun (I know I'll use them again for other themes which is super important to me since I'm all about the reusability) and they even have a motion sensor and crack Halloween related jokes. I know the kids will love this one. 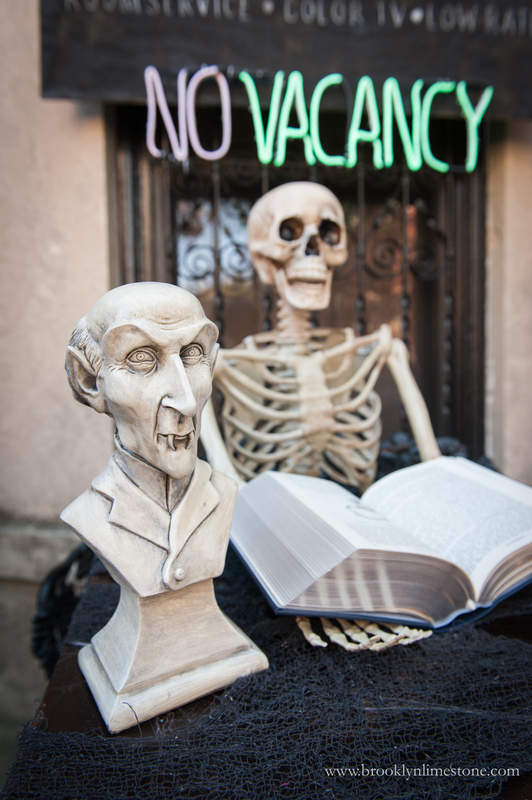 This 'No Vacancy' sign was a stroke of major luck. 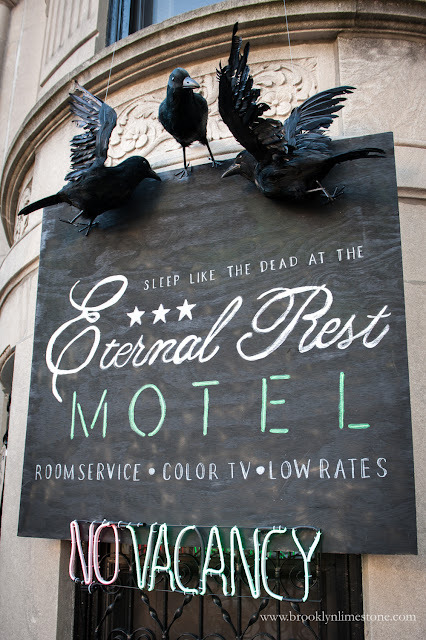 I had already decided the theme when I saw this piece and it finishes the hotel sign perfectly! 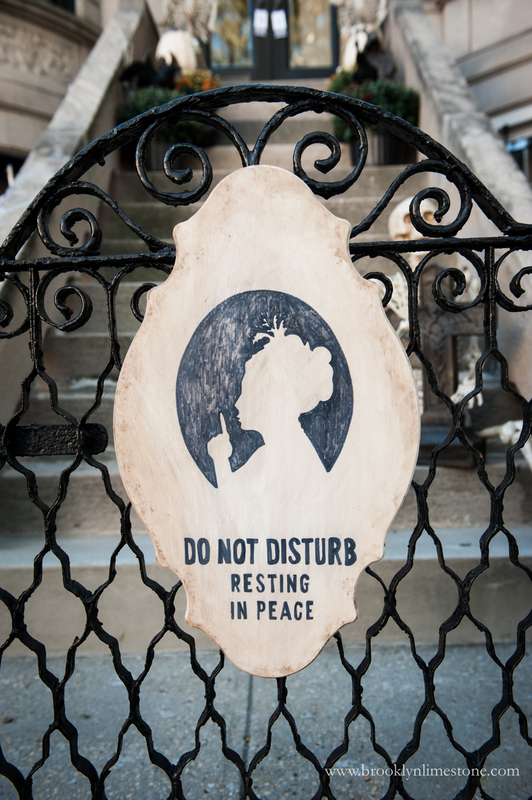 It creates an eerie green glow at night and the "no" blinks on an off occasionally adding to the ghostly air. There are some fun little details that you have to look closely to appreciate. It all comes together nicely and makes a festive way to kick off the most fun holiday season. 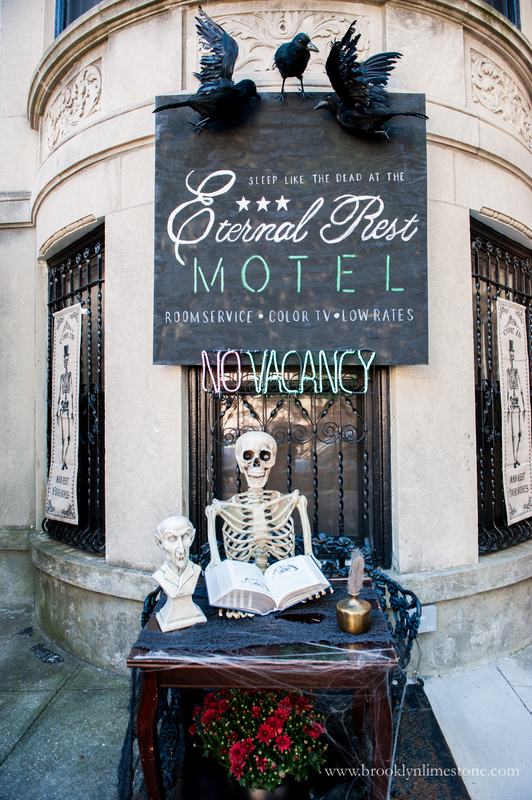 Like my Haunted Hotel Halloween décor? 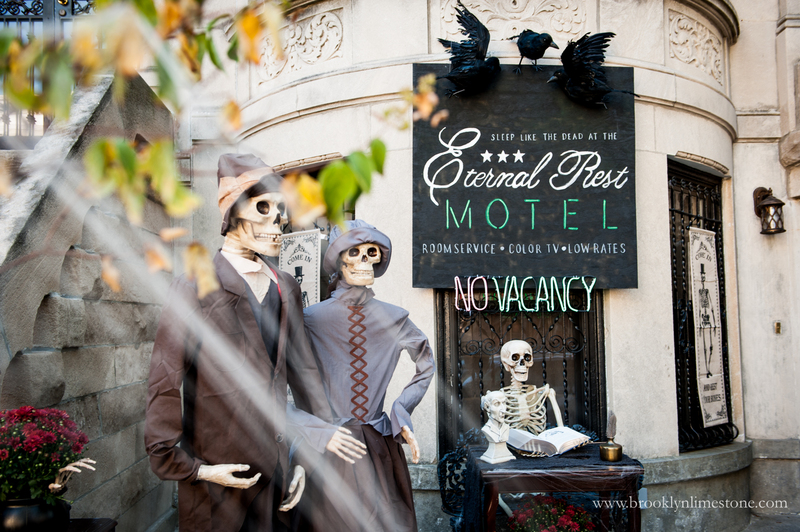 Check out prior years' themes, invitations, projects and parties here. This is probably the post I look forward to the most every year. You've knocked it out of the park again! So well done! Job well done! Always a thrill on your halloween themes! 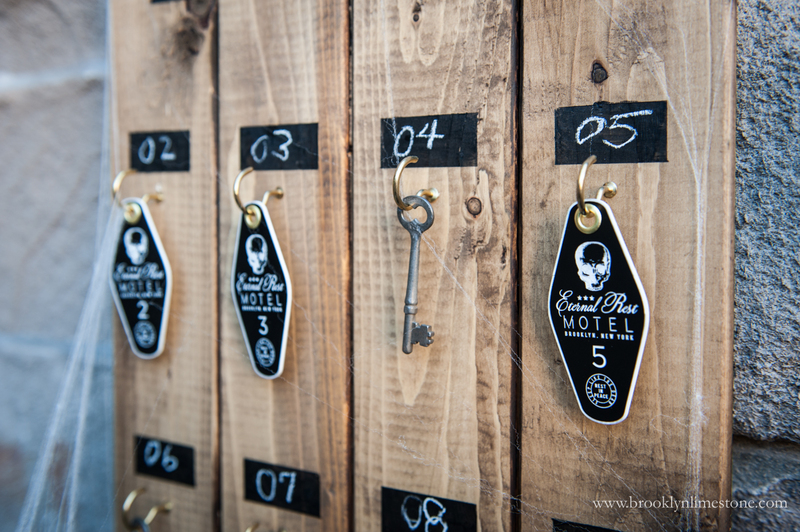 Curious, where did you have the key tags made? I would love to do some for a party favor. Great job, once again! You've outdone yourself. I came here to ask the same question about the key tags. They're spectacular. Love all the little details! It's wonderful. I know you reuse some things from previous years, but do you store everything or do you get rid of certain things each year? I am getting a little tired of my Christmas decor and want to figure out a way to change it up from year to year, but I'm held back by having to store more stuff and the cost. Also, how do you keep things from being ruined when it rains like the book and suitcases? i second michael and amanda.... love your halloween posts so much! seriously the best! this is awesome! OMG you knocked it out of the park again! I always look forward to your Halloween posts every year. Love it! And again! every year you get it right.... thanks for sharing. Wow, wow, wow!!! I absolutely love this. 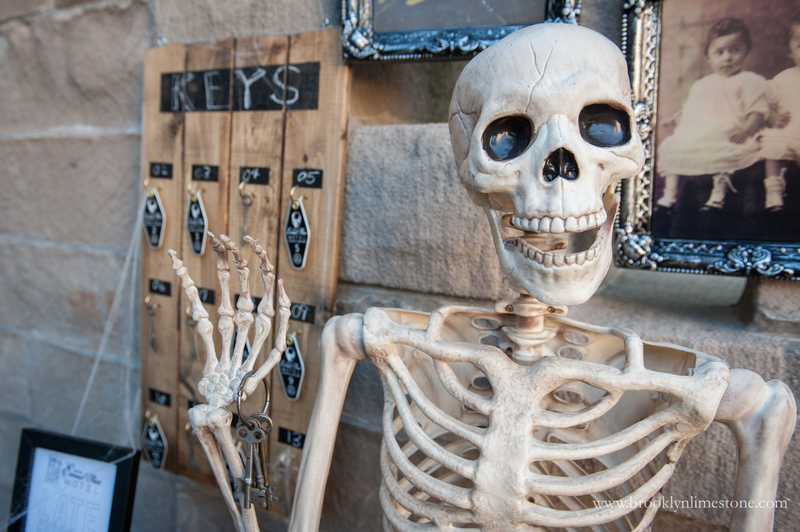 Every Halloween I look forward to your incredible displays. Looks amazing, as usual! I agree, always look forward to this post! Your Halloween posts are my favorite of the year! Excited to see the invites you do! 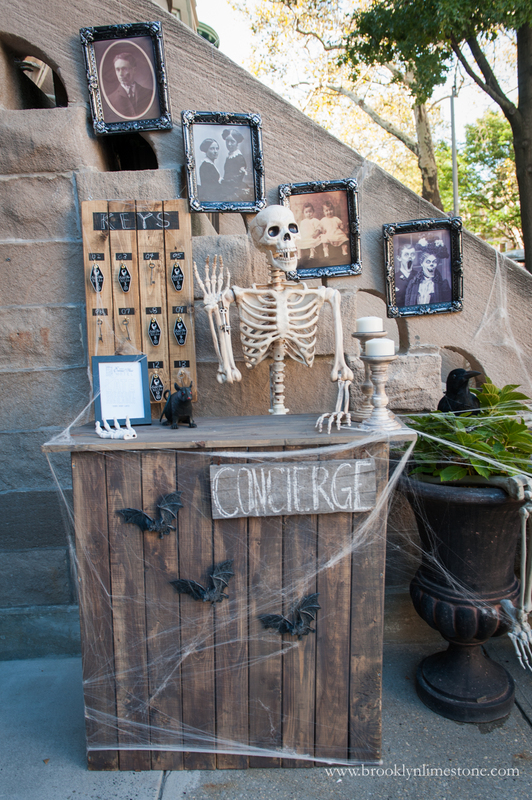 Fabulous Halloween display as always! I so look forward to your Halloween post every year and frantically check in throughout October awaiting it! Your creativity each year is inspiring! I love coming to see your posts but the Halloween is always a great surprise.